Car safety features are so helpful to keep your family safer on the roads. It’s amazing the selection of features we can get on our cars these days. From back-up cameras to lane departure warnings and even pedestrian detection. We can have peace of mind when traveling with our families on keeping them safer. 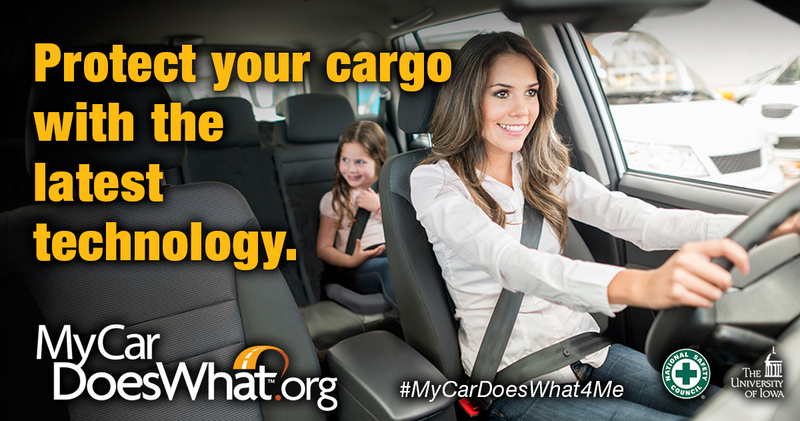 Check out MyCarDoesWhat.org for a simple guide to car safety features. Back-Up Camera. Back-up cameras are probably one of my favorite safety features. With these amazing little cameras you can see objects directly behind you while backing up. Some cars even come with side-view and front-view cameras. However, you should always be aware of your surroundings and still look over your shoulder and in your mirrors as you back up. I love that these features are also available at night. Be sure you keep the camera lens clear of any debris so they can function properly. Anti-Lock Braking System. Anti-lock braking systems (ABS) are required by law now to be on all vehicles. ABS helps prevent your wheels from locking up in emergency situations by restoring traction to your tires. Blind Spot Monitor. We’ve all done it… nearly changed lanes by glancing at our blind spot and not seeing that fast car flying up upon us. Blind spot monitors miraculously warn you of cars driving in your blind spots. Be careful though because some cars may not be detected if they are moving up on you too fast. Lane Departure Warning. Stay in your lane and out of harms’ way with lane departure warnings. This handy safety warning alerts you if you’re drifting out of your lane. These are great for drowsy driver although you shouldn’t be driving if you haven’t had adequate rest. Adaptive Headlights. I love how the headlights on my car actually follow the road and the direction I’m turning. Living in a rural area it makes it great for being able to not only see better but eliminate hitting animals and objects much better. Adaptive headlights help illuminate the roadway along your path whether you’re driving down a straight or curvy road. Push Button Start. I love the push button start in my car and that I have to have my foot on the brake to start it. Plus, it simplifies my life and easier to turn my car on and off. Next time you shop for a new car for your family be sure you check the safety features. The sky is the limit when it comes to the features you can add to your car. How does car safety technology make your family safer on the roads? Comment below and share with us! They have made great improvements, but you still have to be alert. Something could happen out of nowhere and you were waiting for your car to tell you.